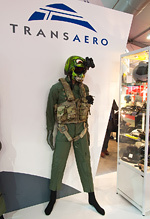 Following widespread condemnation of both the trade and public days at Farnborough International 2012 as being the worst show on record, the organisers promised 2014 would be different. 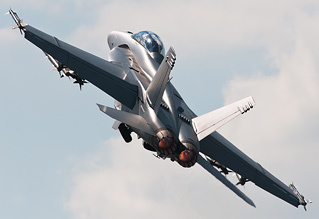 With announcements that the show would see its largest ever attendance by the US DoD and significant changes being made to the public days, many hoped 2014 would be an improvement. How much of an improvement remained to be seen. 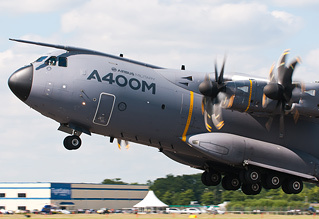 Andy Evans attended the trade days to find out for UK Airshow Review. All images by the author. 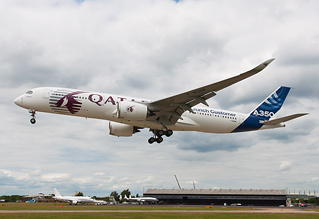 The biannual Farnborough International Airshow is a significant aviation event for the manufacturing industry and politicians alike. It is during the trade days that millions of pounds changes hands between customers and the UK government announces major military acquisitions. It is little wonder that in recent years the public day events have appeared to be little more than an after thought to the organisers. This was all supposed to change in 2014 with an improved trade and public day show however what happened in reality was the event continued to slide further into irrelevant obscurity. The trade days can be split into three specific sections; the exhibition, the static display and the short flying display. This years exhibition was as large as ever, stretching over a number of halls together with some of the larger manufacturers hosting their own bespoke exhibition spaces. There were some noticeable gaps in this years exhibition, caused mainly by the cancellation of the F-35 appearance the week earlier. A large area was devoted to showcasing companies involved in the F-35 outside of the MoD private area for the duration of the show and was, for all intents and purposes, abandoned; almost as if certain parties were trying to shy away from its non appearance (which was ridiculous as will be explained shortly). The main bug bear this year with the exhibition was an escalation of something noticed in 2012, the complete arrogance and rudeness of many of the exhibitors, and for the most part the visitors too. If you were not fully accredited media or someone whose name badge suggested they could possibly make money off, many exhibitors didn't want to know. This ranged from ignoring you, to being very short or to talking to your badge whilst they read it rather than talking to your face. Whilst this was present in 2012, it was surprising how much it had spread in 2014 with even the likes of BAE Systems representatives being quite rude (although the manager of Samlesbury was very friendly and helpful), in 2012 they couldn't help visitors enough. In an environment where business is being done surely everyone should be treated with the same courtesy? That said, some stands were extremely helpful and went out of their way to talk to you - most notably Airbus and Martin Baker who were keen to show off their latest technology to anyone who was interested. Perhaps it is best the exhibition is no longer open on public days if this is how they prefer to treat people? We certainly were made to feel less than welcome. Moving on to the static, this was the usual chaos that we have come to expect from Farnborough trade shows. Aircraft were packed into the limited space so tightly that photography of many participants was virtually impossible. Unusually the DoD stand was packed tightly into the end of the old cross runway next to the exhibition halls and consisted of an F/A-18F, F-15E, F-16C, UH-60 and the P-8A. Whilst the area was larger than in 2012, the DoD display was no where near the size seen in 2010, 2008, 2006 or 2004 we therefore do find Farnborough's advertising that the DoD presence at the 2014 show would be the largest ever dubious and questionable at best. 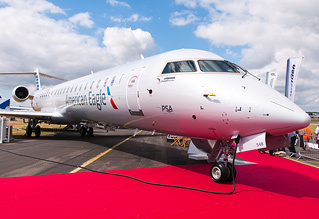 The static display was dominated by Airbus and Boeing who were both competing for best company at the show. Airbus brought along the E-Fan, A380, A350, A400M, A320 and the Portugese C295MPA whilst Boeing brought along no less than two 787s, a P-8A, F/A-18F and the recently flown Boeing Maritime Surveillance Aircraft (MSA), a low cost P-8 alternative based on the Challenger but without any offensive or anti-submarine capabilities. Taking an embarrassing slot in the static fresh from its appearances on HMS Queen Elizabeth and at RIAT was the F-35A full scale mock up which was proving popular for cockpit shots, quite strange considering the exhibition area for the F-35 appeared to have been abandoned! The show of course wasn't just dominated by Airbus and Boeing, Beechcraft/Bell/Textron had a heavy presence with their superb new Scorpion but these were unfortunately locked away in a secure private area which was difficult to gain access to. Finmeccanica also had a large presence with a range of military and civilian helicopters on show ranging from RN Wildcats to Italian Merlins; their display also included an M-346 borrowed from the RSV which meant that, thanks to RIAT the previous week, at one stage an example of everything operated by the RSV was in the UK at once, a massive undertaking. The static could not go without a mention of a pair of special visitors, two AV-8B+ Harriers of the Spanish Navy arguably being the stars of the static for the enthusiast, even if one was locked away ready for flying on the public days, it was a pity that it was perhaps the least well parked aircraft for photography in the entire static! Of course, no Farnborough would be the same without their famous flying display including numerous prototypes. The display is always crippled by the overbearing safety rules imposed on the airfield meaning that displays occur much higher and further away than at other shows limiting photographic opportunities for smaller aircraft except for runway shots. Whilst there were no major fast jet debuts this year, more than likely caused by the situation in the Ukraine preventing the rumoured Su-35 debut as detailed on early layout maps and the cancellation of the F-35; there were still a number of firsts at Farnborough this year. 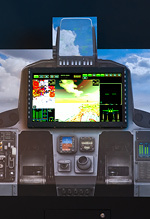 Ranging from electronic and hybrid aircraft to large airliners from Airbus and Boeing. 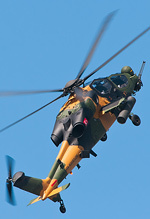 Arguably, with no flying from the Scorpion, the most notable military flying debuts at Farnborough went to the P-8A and the Turkish T-129 ATAK combat helicopter, both of which provided energetic displays that fully showed off their aircraft's capabilities. 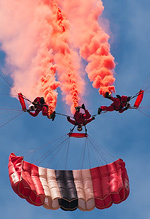 We do have to ask however if Farnborough struggled to find enough acts to fill its trade day flying display this year. Whilst not very exciting, we can understand the inclusion of the Airbus E-Fan and Diamond's hybrid in the display (the latter stopping its prop in mid air) as they exemplified the pinnacle of current technological research. However we cannot understand why such a substantial amount of time was devoted to a pair of UAVs that appeared no bigger or advanced than a pair of remote control aircraft plus a pair of parajets giving a synchro display. Farnborough has always been about showing off the biggest and best technology available, and once again in 2014 it seems the organisers have forgotten this as they continue on the slippery slope to pointlessness. Something that Farnborough does well is the proximity of the runway to the crowd, allowing for some superb fast action shots, especially of larger aircraft. We were therefore not disappointed to get the usual spectacle from the 787 and A380 blowing grass everywhere only to be joined by the A350 which surprisingly performed a less spirited display than the A380! Rounding up the flying display and giving a glimpse of the future, Finmeccanica provided an unusual three ship display consisting of the M346, M345 jet trainers and SF-260TD prop trainer representing a complete training solution. 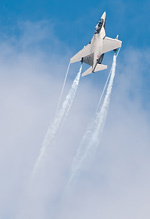 Following a few formation passes the jets peeled off to perform a short duo display before the M345 then peeled away, allowing the M346 to perform a spirited (the best fast jet display of the show) display for the crowd. The M345 has been ordered to be the new aircraft of the Frecce Tricolori and the aircraft on display was painted in their colours. Whilst it did not perform a full display, this is a concern. The impression this aircraft gave was that it is underpowered and possibly not capable of the high energy displays we are used to from the Frecce, perhaps this will be something we need to accept. Conversely the M346 seemed perfectly suited to the roll and it is a crying shame this wasn't chosen as the new display aircraft. So, what impression did the trade days give this year? One of decadence and snobbery where if you weren't someone from whom money could be made, you were a nobody and treated as such. Farnborough must shake this attitude off. They don't help themselves by charging £16 for hot food in their restaurants which is of £5 quality, they make RIAT look cheap. Whilst the author did not attend the public days, it is clear from our forums that the promised changes to improve this show made things worse, especially with star flying acts from the trade days departing prior to them. The public days certainly don't appear to be worth the rip off cost the organisers charge for a ticket and unless something drastically changes in 2016 we really can't recommend people attend them in the future. 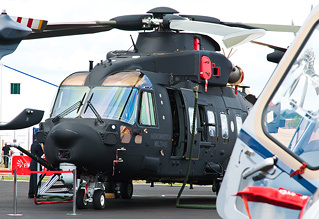 There are much better value and cheaper shows out there where you get to see more, indeed, RIAT represents a comparable show for far better value. Will Farnborough listen to the fact that they need to drastically change to stay relevant? Probably not, they will more than likely point to the US$152billion in aircraft orders placed during the show to show that it is a success and our criticism is unfounded. However compare that order book to Dubai 2013 (US$206.1billion in aircraft orders), and the real (shrinking) size of Farnborough's relevance is abundantly clear. Sadly the biggest losers here are British industry not the enthusiast and for that reason, something must change.